The Walt Disney Company has been working in Russia since 2006. Iconic company to get more involved in Russian market. 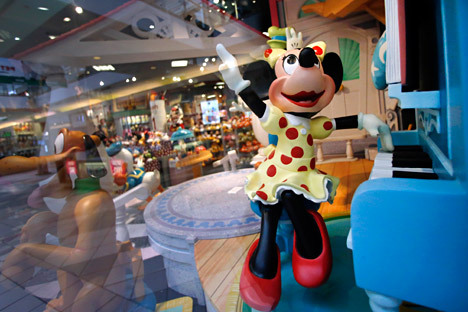 Two Walt Disney brands will soon appear in Russian shopping centers: Disney Play (toys) and Disney Style (clothes). The announcement was made by Yevgeny Butman, a partner at Ideas4retail, a retail group that helps launch international brands on the Russian market. Butman’s company will be involved in developing the stores. In 2013 The Walt Disney Company began negotiations with the Detsky Mir (Children’s World) chain of stores and the Inventive Retail Group (IRG), looking for a franchising partner to develop new toy and clothes brands in Russia. According to the agreement, each store network had to provide 100 retail points with 150-square meters of space each. A company representative said that Walt Disney wanted to select a partner by 2014, but about a year ago all talks with Russian retailers were discontinued, sources from Detsky Mir and IRG told Izvestia. Officially these two companies have not commented on the Walt Disney tender. An acquaintance of Butman says that the businessman was able to persuade the iconic company to work with his company. The Disney Russia press office has made no official statements on these developments. It will cost about 300 million rubles (about $3.8 million) to open 200 retail points in Moscow, says DNA Realty, however, the exact dates of the stores’ openings are still not known. The Walt Disney Company has been working in Russia since 2006. It is the co-owner of the Walt Disney Studios Sony Pictures Releasing CIS film distributor and the Disney Channel and also offers licenses on consumer goods. Ideas4retail belongs to billionaire Alexander Mamut and Butman. The company develops the Hamleys, Imaginarium and Mamas & Papas franchise outlets and has its own brand, CookHouse. First published in Russian in Izvestia.